Simostronomy: Restless Universe- Cataclysmic Variables! Our next to last AAVSO Podcast is now up on the 365 Days of Astronomy podcast site. Today we discuss my favorite type of variable stars, cataclysmic variables! Most CVs are close binary pairs containing a white dwarf (a collapsed star with the mass of the Sun squeezed into the volume of the Earth), and a red dwarf, about the size of our Sun, but redder and less massive. This pair of stars is so close together that they orbit each other in just a few hours. The gravitational pull of the white dwarf causes the red star to be stretched out of shape as its atmosphere is stripped off and falls towards the white dwarf. Because the infalling gas can't stream directly onto the surface of the white dwarf, it forms an accretion disc, with the white dwarf at its center. The accretion disc usually outshines both the red star and the white dwarf in visible light. 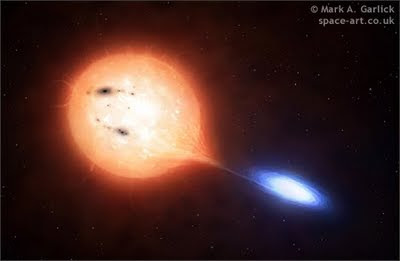 As if this stellar cannibalism weren't enough, what really makes this interesting is that occasionally, and we never know when it will happen for sure, this accreted material becomes unstable and crashes down onto the very hot surface of the white dwarf. Tremendous amounts of energy are released in an outburst, and the system may brighten by thousands of times its normal quiescent level. CVs come in many flavors- novae, dwarf novae, and magnetic binaries known as polars and intermediate polars. We give an overview of all the critters in the cataclysmic variable zoo in this episode, so pop on over to the 365 Days of Astronomy website and check it out. If you'd like to learn more, or keep up on the latest developments in CVs, you can check out the AAVSO Cataclysmic Variable Section website, or check out these previous postings on CVs, or these two previous Slacker Astronomy podcasts, where I interview several leading astronomers in the field. Good Podcast, just finished listening to it. Great team too. Looking forward to the next! Do we have images something like the artwork? I'm thinking maybe CHARA or some other interferometer has been pointed at stuff like this. I recall an early CHARA movie with two stars doing a dance emitting some material out in a spiral... But Keck and maybe VLT have done interferometry. They certainly wouldn't look anything like the artwork here.